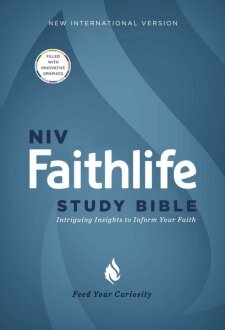 favorite study bible combining all the features of a full color bible together with relevant, applicable articles and notes. Full color bibles are not a new thing. But in the past, most of the new, impressive full color bibles had a cultural historical or archaeological theme. While impressive, the study notes and features were more scholarly focused for those readers interested in the historical context of the bible. The NIV Faithlife bible has full color features, graphics, and illustration as well as relevant articles to address relevant issues and spiritual questions. For example, the well known Christian author, Randy Alcorn has written an article addressing suffering. Other notable Christian writers and leaders have contributed to this bible's articles too! In addition to articles addressing matters of faith- there are also high-tech, full color diagrams of the creation sequence as well as blue prints of the ark! This is an eye opening bible for all bible readers- from beginners to advanced readers. Whether you are looking for your first bible, or if you want to upgrade to a brand new bible, you will not be disappointed with this choice. UPDATE: After my initial impression after first viewing this bible, after using this as my primary bible, I have decided to provide an update to my original review. Firstly, I found the paper to be very thin. Unlike the glossy finish of other full color bibles, the paper has a thin matte finish and curls slightly after contact with my fingerprints, after use. Secondly, I found the color graphics, diagrams and maps to be more subdued, muted colors than I expected. With the exception of a few impressive graphs found in Genesis: the diagrams of the ark and the graphic depiction of the creation of the world, the colors are not bold or bright, but rather a softer set of colors- almost similar to the effect of pastels. The coloring and detail of maps at the end of the bible are created using softer colors as well. This gives the maps a washed out look. There are some photos of archaeological finds including ancient coins. There are not truly in full color but appear to contain spot color- black and white with blue tones. I am still pleased with this bible overall and intend to use it as my primary study bible. However, I found the graphics overall to be more subdued and the maps to have a washed out appearance than the other full color study bibles I have had the opportunity to review.